Throughout Europe it is common to see mosaics used on ceilings. Here in the States, not as much. 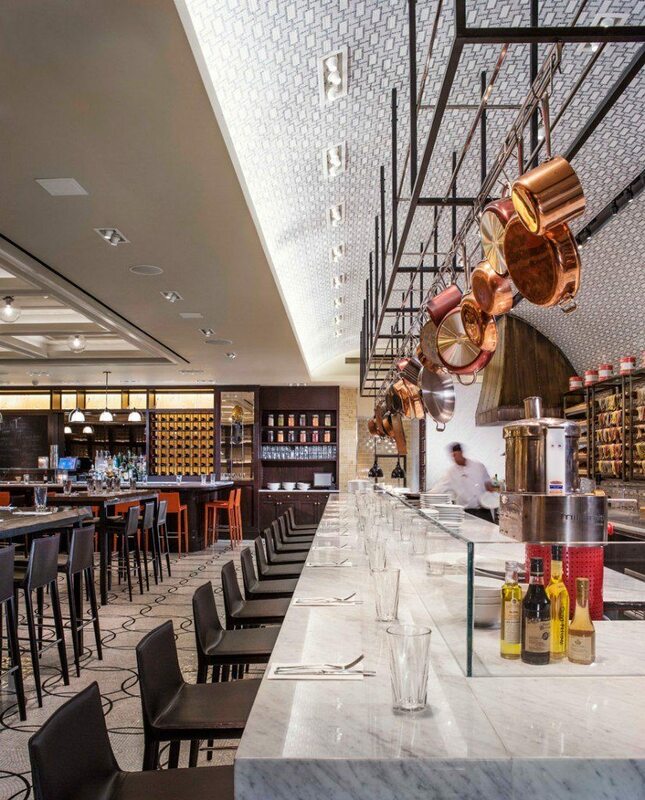 So we were thrilled when designer Jeffrey Beers envisioned a European-style food hall concept for chef Todd English at New York’s famed Plaza Hotel. The Jeffrey Beers team came to us with a plan for a gorgeous open pasta kitchen with a backsplash wall and barrel-vaulted ceiling they wanted to cover with a stunning mosaic. Mosaic is a natural choice if you need to apply hard surfacing to any rounded area in a design, since the small pieces allow a hard surface to cover a curved area. When designing for the curve of a vault, it is important that the tesserae be sized appropriately to gracefully wrap the arc. The designers selected the Modern patten from our Moment Collection, and we happily customized the scale so that the maximum height of an individual piece would be small enough to wrap beautifully yet large enough to preserve the bold geometry of the design. Because AKDO makes our our mosaics at our own ateliers in Turkey, we’re able execute projects such as this one often in less time and at a lower cost than other brands which don’t have the advantage of our vertical supply chain. 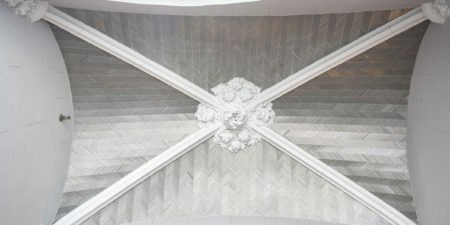 The result is this crisp, sleek vaulted wall-into-ceiling patterning in natural stone that adds drama and detail. 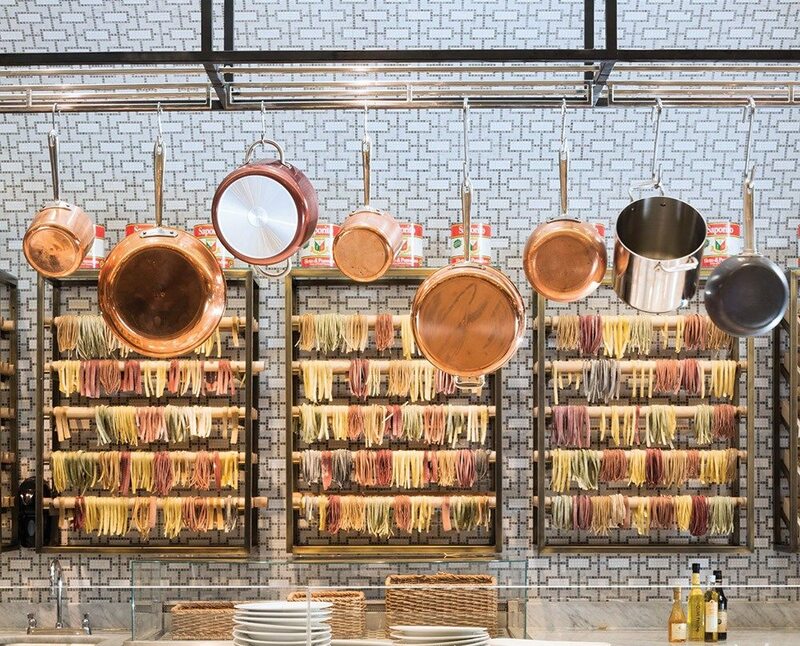 We love how they punctuated the sweep of polished stone with that patina’d metal range hood, drying racks for their fresh pasta, and overhead pot racks. The thoughtfulness that went into this one detail is a perfect example of why Jeffrey Beers is known for creating some of the world’s most outstanding hospitality interiors.